CLASSICAL MUSIC concerts have always formed part of the Galway International Arts Festival, but this year, classical music has a notably larger, more prominent, placing. Indeed it is almost a mini-festival within the GIAF itself. "The festival is really pushing out the classic side of things this year," notes the distinguished Irish pianist Finghin Collins approvingly. "It's a wonderful thing." The GIAF classical music concerts, featuring the RTÉ National Symphony Orchestra, cellist Leonard Elschenbroich, the ConTempo Quartet, violinist Elizabeth Cooney, and Finghin Collins, take place on the NUI Galway campus from July 17 to 20, with music by Elgar, Beethoven, and especially Schubert. Finghin is one of Ireland's finest and most acclaimed pianists. As well as performing across Europe, the US, and Asia, he is also the artistic director of both Music for Galway and the New Ross Piano Festival. 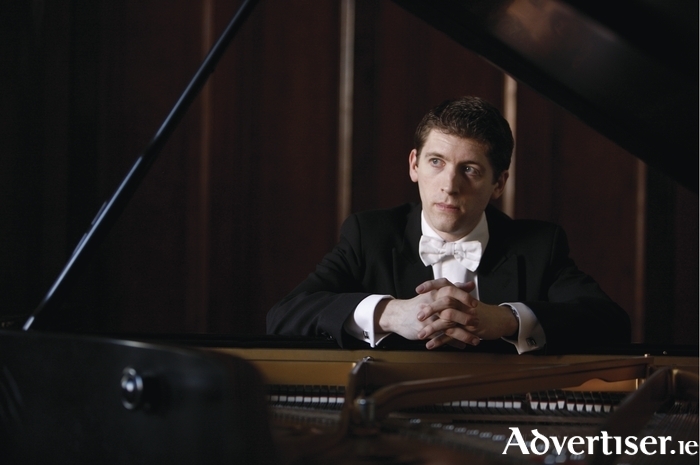 He plays a prominent role in the GIAF classical concerts; joining Elizabeth Cooney in the Aula Maxima, NUIG on Monday July 20 at 8pm, and the RTÉ NSO in the university's Bailey Allen Hall on Saturday 18 at 6pm. He is also well placed to give an informative view of what audiences can expect from the other classical events. The Collins/Cooney concert will feature music by Schubert and Elgar. Less familiar though will be Notturno and Tarantella Op 28 by the Polish composer Karol Symanowski. "He's not that well known," says Finghin, who says audiences can expect something more ambient than they may be used to. "Symanowski creates these beautiful sound worlds and the piece is quite diaphanous and transparent. It's not heavy and hard, it's atmospheric, that can make it difficult to play," says Finghin, "yet it's very evocative, like a reverie. It's like the kind of music you might hear if you were going in for a sauna. It's very chilled. You'll waft away!" A highlight of the classical strand at GIAF 15 will be the performance, by Finghin and the RTÉ NSO, of Beethoven's 'Emperor' concerto, or to give it its official title, the Piano Concerto No 5 in Eb Op 73, which begins with a wonderful series of flamboyant flourishes across the piano keys. How difficult a piece is it? "That part is not the most difficult," says Finghin. "It's quite fun, it mostly arpeggios, but the concerto has difficult moments in the middle, it's not a walk in the park, there is difficult fingerwork throughout. Ultimately, the 'Emperor' is very life affirming, it's in that big key of Eb Major, it's very satisfying to play. "Life affirming" is a term Finghin returns to when considering the place of the 'Emperor' concerto within Beethoven's body of work. "It's one of his most famous and powerful pieces," he declares. "If someone from Mars came down and asked 'What is Beethoven?' this is what you would play. The concerto is about the triumph of the human spirit. Beethoven had a lot of trouble in his life. He went deaf at young age, he had a lot of difficulties in his relationships, he had a bad temper, but through his music he fought those demons, and a lot of his music deals with hope over despair. Through the concerto you can hear Beethoven asserting himself and asserting strength, you can feel that in his music. In comparison Mozart or Schubert are more subtle, gallant, and refined. Beethoven's more 'four square', but the second movement of the concerto is very refined and elegant, so he has it all really." That concert, which takes place on Saturday July 18 at 6pm, is one of two GIAF events dubbed Orchestral Masterworks. The other is on Friday 17 at 6pm when German cellist Leonard Elschenbroich (pictured above ) joins the NSO to perform Elgar's Cello Concerto in Em Op 85 and Rachmaninov's Symphony No 2 in Em Op 27. "He is a great young cellist," says Finghin, who is passionate about the cello, having organised Music for Galway's most recent season of events, Cellissimo, as a celebration of the instrument. "There are a lot of great cellists emerging in Europe now, but he is very much at the vanguard. He's a charismatic player, very enjoyable to listen to, accomplished, and puts a lot of passion into his playing." One composer dominates the 2015 GIAF classical music strand like no other - Franz Schubert - with four days of concerts featuring his music. First up is the three day 'Schubert-fest' from the RTÉ NSO and the ConTempo Quartet in the NUIG Aula Maxima from July 17 to 19 at 1pm. The NSO, ConTempo, and Leonard Elschenbroich will perform the Quartettsatz in Cm and Quartet in Dm on July 17 at 1pm and the String Quartet in C on July 18; while the Octet in F will be played by ConTempo, along with John Finucane (clarinet ), Bethan Watkeys ((horn ), Hilary Sheil (bassoon ), and Dominic Dudley (double bass ). Then on July 20, as part of their concert, Finghin and Elizabeth Cooney will perform Schubert's Sonata for Violin and Piano in A Maj.
"Schubert is one of my favourite composers," says Finghin. "His great gift was for melody. He was also incredibly prolific. He wrote 600 songs, his cello quintet is one of the greats, it's extraordinary what he achieved considering he died at only 31. For me he is one of the most important composers in history. His music can be long and expansive, but I can listen to it for hours and hours." Finghin also speaks very highly of the ConTempo Quartet - who are both the Galway ensemble in residence and the RTÉ ensemble in residence - having worked with them in his capacity as Music for Galway artistic director. "I think we're very lucky to have them, especially when you think of the very high level at which they play," he says. "They give finely etched performances, they are great communicators, giving audiences the backgrounds to the pieces of music, and their work with schools and children. It's not every string quartet that can be that versatile, and they're always smiling and laughing. We value them very much at Music for Galway. For tickets to the GIAF classical concerts see www.giaf.ie See also /www.finghincollins.com.